Currency hedging is often approached with an all-or-nothing mentality: either full hedging of all foreign exchange (FX) positions or no hedging at all. As a more nuanced alternative, we suggest systematically harvesting the benefits of the FX style factors carry, value and momentum. In particular, we demonstrate how these factors can expand the opportunity set of traditional asset allocation when pursuing either FX factor-based tail-hedging or return-seeking strategies. "There are good reasons to believe that the optimal currency hedge lies between the two extremes of a full hedge and no hedge at all. We believe that it pays off to have a closer look at currency style factors for determining a beneficial currency allocation. 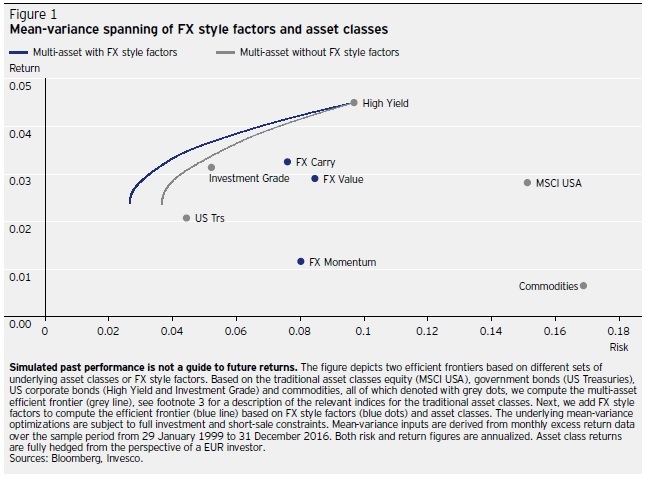 FX style factors vis-à-vis multi-asset classes We will now demonstrate the mean-variance properties of FX style factors relative to traditional asset classes. 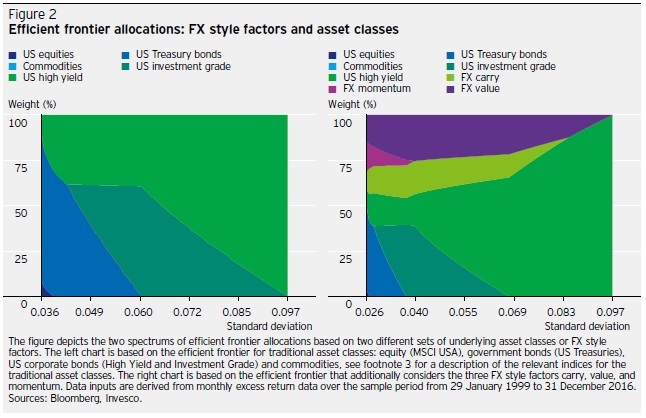 Figure 1 depicts a mean-variance diagram of the three FX style factors carry, value and momentum, as well as five traditional asset classes as given by US equity, US Treasuries, US corporate bonds (investment grade and high yield). bonds, whereas the latter allocation for less riskaverse investors gives way to investment grade and high yield credit positions. Second, adding the three FX style factors to the mix would significantly expand investors’ opportunity set. The ensuing efficient frontier including FX styles shifts considerably to the northwest compared to the multi-asset-only allocation. Obviously, the inclusion of the FX carry and value factors is expanding the portfolio return perspective. Still, judging from the corresponding mean-variance allocations, we learn that all three FX style factors crucially enhance the tail-hedging capabilities of any multi-asset investor, as demonstrated by their large portfolio weights in the minimum-variance portfolio. While FX momentum does play a role, especially for very defensive allocations, we see that FX value is beneficial across the whole spectrum of risk profiles. Likewise, allocation to the FX carry trade replaces some of the high yield allocation, reflecting its close association with genuine equity and credit risk. and commodities."